I would like to start this article with lyrics from the song we ended the FINkers United event with, yesterday: “it’s a beautiful day / don’t let it get away”. Why? Because this is how you feel when the effort of hard late-night hours of work and preparations do pay off. And I won’t let it get away, without thanking each and every one of you who was present, for turning FINkers United into a successful event. We made it and we made it together. I am, no, we, at Allevo, are overcome and deeply moved by the fantastic cooperation and level of networking achieved. It was quite refreshing to get different people to openly discuss a theme of interest (at least for us). So, Thank You, for your substantial contribution, for sharing your experience, your knowledge, your valuable opinions and ideas. Thank You to our guests, Thank You to our facilitators, Thank You to our distinguished panelists, Thank You Mela – our director of the event :), we couldn’t have done it without you. I think what was even more exciting is the fact that we accomplished all that while also having fun. 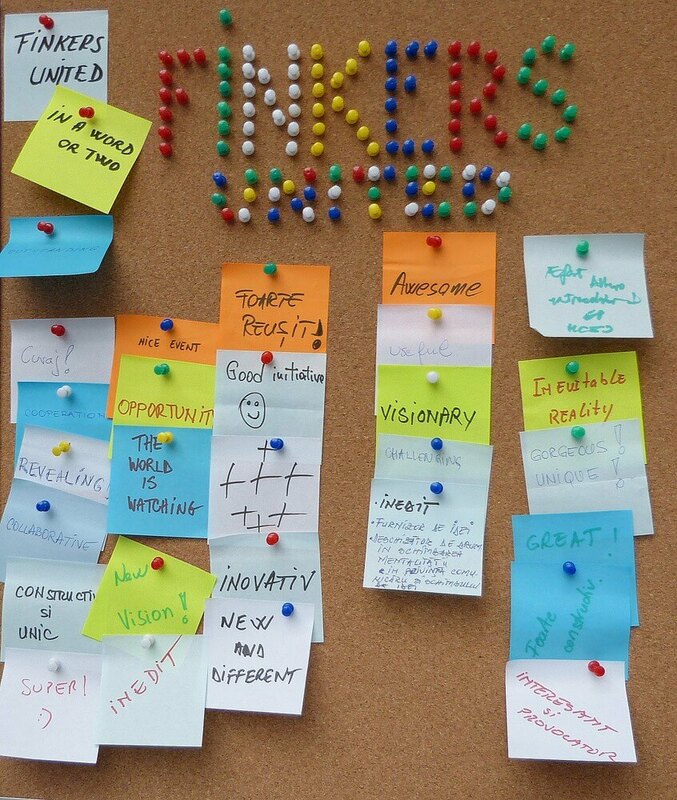 It felt that way and was even confirmed by a post-it on the “FINkers United in a word or two” board where participants were asked to post short impressions on the event. Some of the other words pined to the board were: “collaborative”, “innovative”, “constructive”, “unique”, “visionary”, “revealing”, “challenging”, “useful”, “awesome”, “inevitable reality”, “interesting”, “provocative”, “new vision”, “novel”, “cooperation”, “courage!”, “super!”, “very successful”, “new and different”, “+++++++”, “good initiative”, “gorgeous”, “great”, “opportunity”, “educational”, “outstanding”, “the world is watching”, “ideas provider”, “pioneer”, “very good”, “extraordinary effort”. As I said before, we have the heart to go all the way, because we truly believe in this project, but it feels very good to have people like you appreciate it and support it. So, that’s why today is a beautiful day. Because we can still feel the sweet taste of success in our mouth, as 40 out of 43 respondents would ABSOLUTELY recommend this event to a colleague! An Innotribed event! Guess I’ll see you at our next event then 🙂 In the meantime, stay in touch through our website, blog, tweets, Facebook page, FINkers United community page, to get first impressions and photos from the FINkers United event. Anything you want to discuss? You can use our FinTP forum.